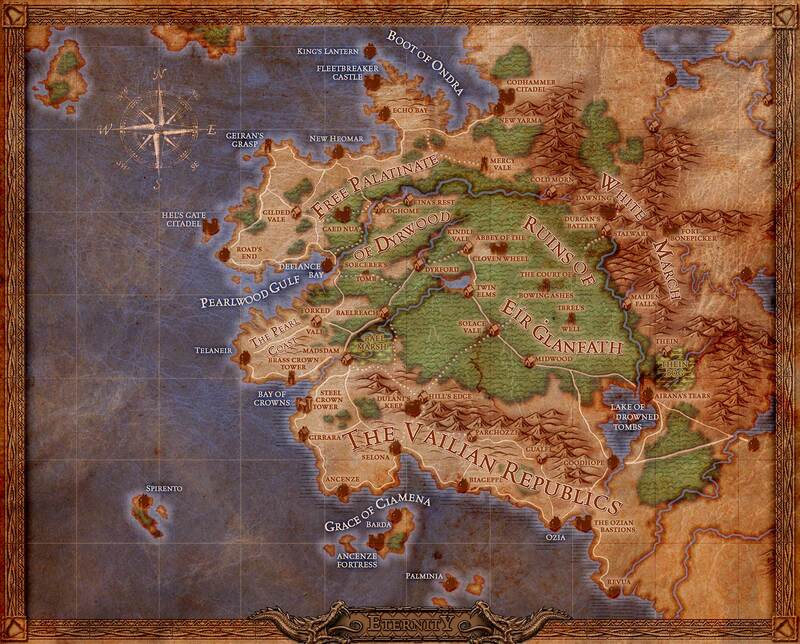 Walkthrough and Game Guide describes all the important locations in Pillars of Eternity game. Here, you will learn which NPC you should see in order to receive a quest and where to go to complete it. All major locations are accompanied with maps. The following elements are marked on the maps: characters we meet in the game world, hidden secrets, chests and other treasure containers, crafting ingredients, traps, secret passages, aggressive opponents, and bosses that are especially difficult to defeat. 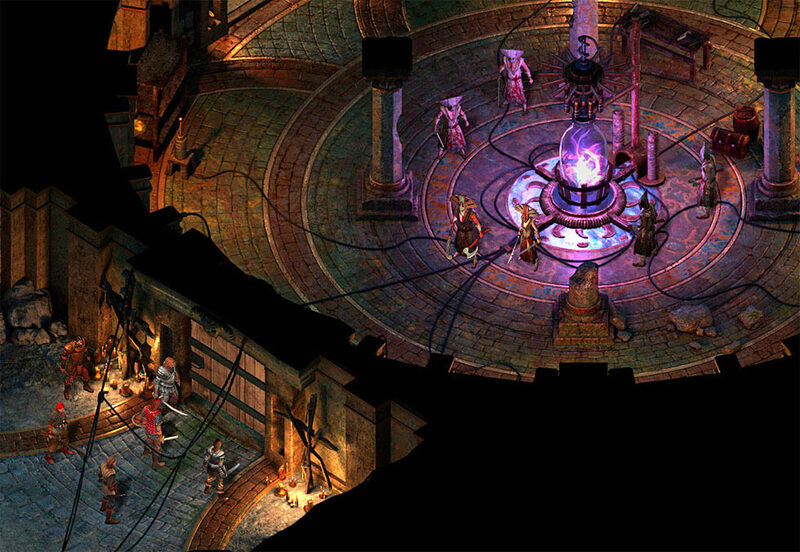 In Pillars of Eternity game, many quests can be solved in more than one way. In this guide, I am trying to show the optimal way to solve a given quest. 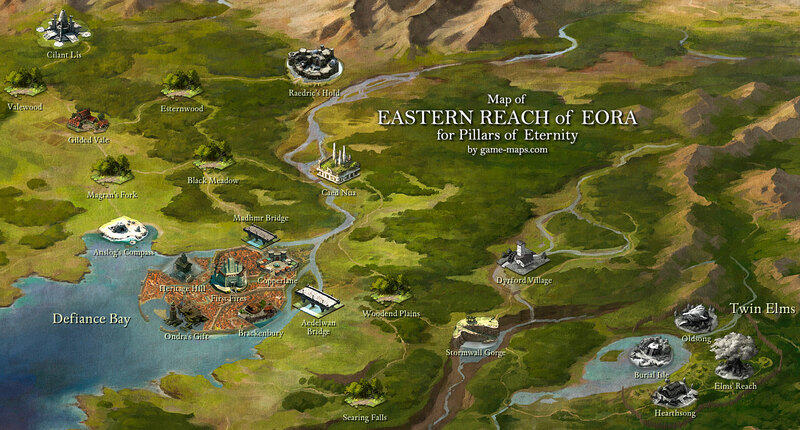 All the maps in the World Atlas for Pillars of Eternity are fully explored and presented without fog of war, so as to show you every place that you can visit. I have also prepared a full list of quests, so that you will know if you have found all of them while exploring the game world. In most cases, in order to discover a location on the world map, we must first find a way leading to it. This is done by exiting one of the previous locations on the proper side. The maximum number of team members there can be simultaneously amounts to six: your character plus five companions. You can leave the remaining companions in the Stronghold once you obtain it. Your character. If you're a novice player, choose Warrior as your character. Even a Warrior can open locks and detect traps (if he or she has a Mechanic Skill). If you're more advanced then Rogue may be a good choice. Magic-related classes are best for experienced players. Max Exp Level in the current version of Pillars of Eternity is 12. To achieve it, you need to complete basically all side quests. During conversations with NPCs, only the parameters of your main character influence the course of the dialogue. Experience is shared between team members. A smaller team means more experience points per one character, whereas a larger team means less experience points per one character. Apart from Companions relevant to the storyline of the game, you can also choose to add team members from among characters created in taverns. They are treated like normal Companions except that they don't have their own quests. Level of opponents do not adjusts to the level of your character. If you fail to beat an opponent, return to fight them when your level is higher. Scouting mode is used both for sneaking and for finding hidden objects, such as traps and secret containers. Use this mode all the time. If the reduced walking speed in this mode annoys you, press "D" to speed up time. Mechanic Skill is very important because it allows to disarm traps, pick locks, and use a variety of tools. At least one of your characters, preferably the main one, should have this ability. The Stronghold is going to become your own house in the game once you discover and explore Caed Nua, which will happen quite soon into the game. As soon as you have your stronghold, leave one or more of your Companions there, and they will be able to carry out tasks for Stronghold which you can assign to them remotely. In the world of the game, especially in taverns and on the streets, we will meet many characters with whom we are not able to engage in any dialogue beyond the option "Reach out for the soul". These characters have no relevance to the gameplay or story and their only purpose is to build the Lore of the World. The item box that you carry is spacious, so don't worry that you will run out of space in your inventory. Stealing items from containers lowers your reputation. You can tell whether you're committing theft by the color of the cursor - red hand means theft. You can read documents in guarded containers without penalty. By opening closed containers (Lock Pick) you receive experience points. It is a good idea to open all containers that you can find. You can also open containers that are guarded, but you can't take anything from them. Items in the game do not wear out or get damaged, unless they have a certain number of uses. Some creatures and armor types are especially resistant or vulnerable to specific types of damage. Pets don't serve any particular purpose in the game. Any weapon, shield, or suit of armor can be enchanted by clicking the Enchant button on its description page. Potions, scrolls, and food items can be created by clicking on the Crafting button in any party member's inventory. Camping in the wilderness requires camping supplies; you can buy them in stores or find in chests. 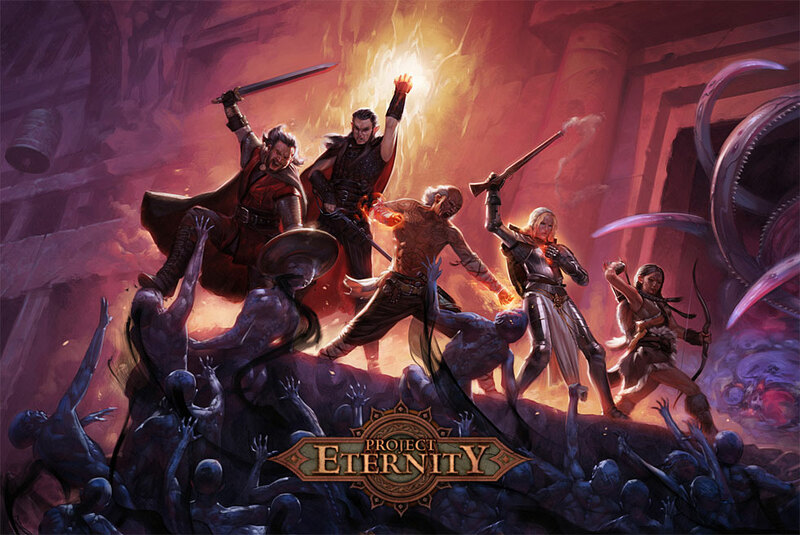 In Pillars of Eternity there is more than one possible ending. Note! Completion of the main story arc ends the game and it is no longer possible to complete the unfinished side quests. game genre: cRPG, Old school, isometric, party-based computer RPG. setting: High/Epic fantasy. Sword and sorcery. New fantasy system. business model: Crowdfunding. Retail Box and Download Version. 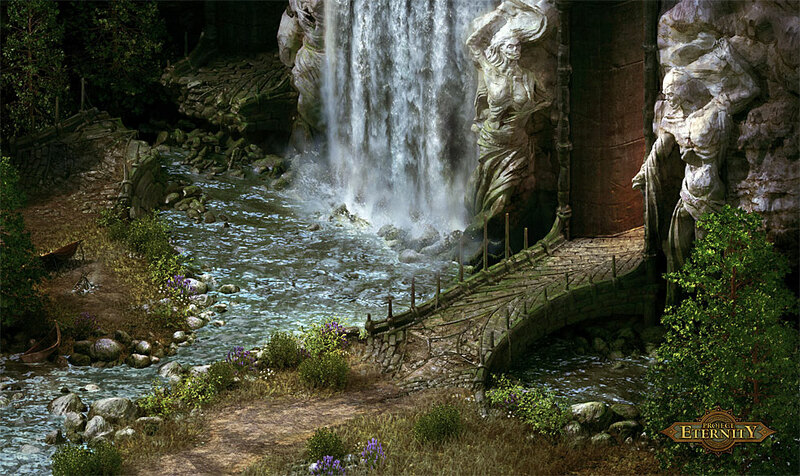 For me, Pillars of Eternity is a nostalgic journey into the world of classic, old-school cRPGs. In the game, you can control an entire party composed of six people, but it's you - the main character - who is the center of the whole game. These are your characteristics, decisions and choices that shape the world that surrounds you. 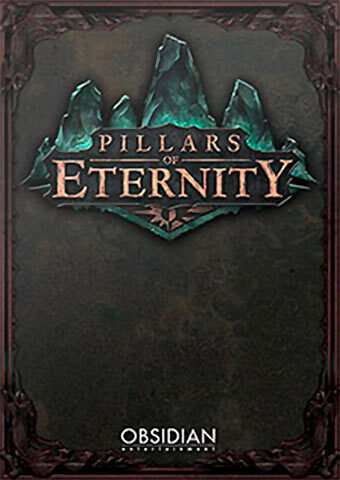 Single-player is the only mode available in Pillars of Eternity, but the game makes up for this with a complex story and lore of the world that we traverse. The game is available in English, French, German, Spanish, Italian, Russian, and Polish for Windows PC, Macintosh OS X, and Linux, and can be purchased on Steam and GOG.